Have you ever wanted to see how games are made, get involved with like-minded people and create something yourself? 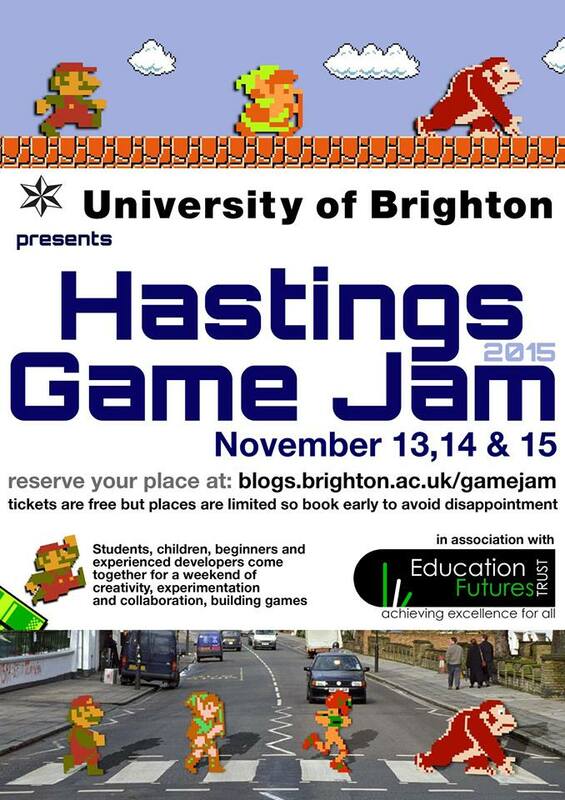 If so, you may be interested in participating in Hastings Game Jam! Hastings is a relatively quiet seaside town in the South East of England, so this event is guaranteed to liven things up for both local and non-local residents interested in the gaming industry. There's no fee to get in either. All you need is a ticket and an interest to get involved, working as part of a team to create sound, artwork and gameplay, with prizes available for the top two projects. The event itself is in association with Brighton University and will be held at the Hastings Campus, welcoming beginners, students and industry professionals alike to all get involved and share their creative thoughts and visions. The event itself will take place Friday 13th - Sunday 15th November. You can find out more information here and to guarantee a place, register for your free ticket here. On campus you'll find University staff, Student Ambassadors and Volunteers to answer any queries or concerns you may have on the day. Plus, be sure to fire any questions Paul Oliver's way on Twitter. He'll be there to help everyone out and is responsible for making this all happen, organising the event with Brighton University himself. Paul has been developing his own freeware games for years now and has ambitious dreams of turning Hastings into a gaming hub for the South East Coast. If that wasn't enough, if you're quick, you'll also be able to grab yourself a free Hastings Game Jam 2015 T-shirt, so what have you got to lose? Get involved, learn a few things along the way and have a great time!